That Super Bowl thingy is coming up soon. Party time! And what’s a party without dip? 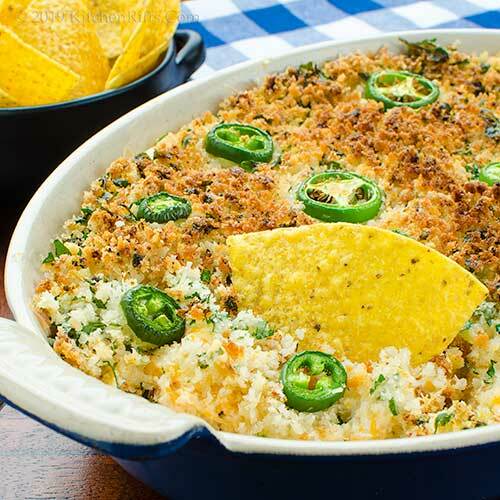 This Baked Jalapeño Popper Dip would be perfect for game day. You can put it together quickly, then socialize while it bakes. Score! Not in a Super Bowl party mood? Then just call this dinner. We love jalapeño poppers (whole jalapeño peppers stuffed with cheese, then dipped in breadcrumbs and deep fried). But we don’t enjoy making them – too much mess and work. So when we get the craving, we just make this terrific dip instead. All the flavor without the fuss. 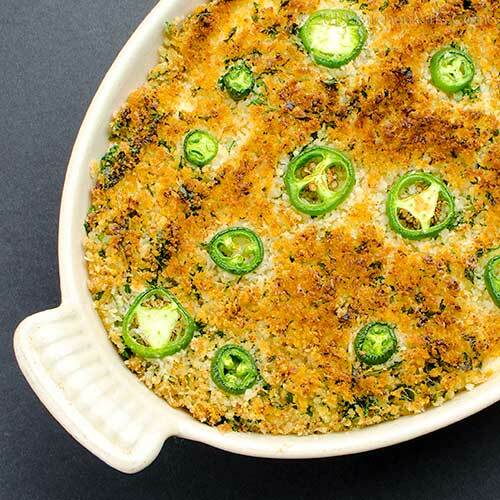 This dip combines jalapeños with cheese under a topping of breadcrumbs (to mimic the breading on fried jalapeño poppers). We strongly recommend serving this dish hot (it’s much less flavorful when cold). So prepare it right before serving. If it cools off before you’re finished, just pop it into the microwave (it reheats nicely). Bake (and serve) this dip in an ovenproof container that holds about 2 quarts. We like to serve it in a gratin pan or skillet. But a deep dish works too. What scooper to serve with this dip? We like tortilla chips. But you could try potato chips, crackers, even crudités. Thinly sliced bread rounds (toasted or not) or pita slices would work too. Prep time for this dish is 20 to 30 minutes. Baking adds about 20 to 25 minutes. Leftovers keep well for a few days if refrigerated in an airtight container. But do heat them before serving. Remove the cream cheese from the refrigerator a couple hours before you plan to make the dip (so it can warm to room temperature). When ready to make the dip, turn the oven on to 375 degrees F.
Wash and dry the jalapeños, then trim off the stem ends. Slice one pepper into thin rings and set it aside. For the remaining jalapeños: Cut each pepper in half lengthwise. Use a teaspoon to scoop out the ribs and seeds (optional, but these hold most of the heat). Chop the peppers into very fine dice. Set aside. Then wash your hands with soap and water to remove any hot jalapeño oil from your skin. Peel the garlic and chop it into fine dice. Heat a frying pan (preferably nonstick) over medium stovetop heat. When hot, add the oil. Add the diced jalapeños and sauté them for 4 minutes. Then add the garlic and sauté for another minute. Remove the pan from the heat. Place the cream cheese in a medium-sized bowl. Use a sturdy spoon to cream it (or just use a mixer). Add the shredded cheddar cheese and the sour cream, then mix to blend well. Add the jalapeño-and-garlic mixture, then stir well to mix all the ingredients. Scrape the mixture into the container you’ll use to bake the dip. Now make the topping: Melt the butter. Grate the Parmesan/Romano cheese. Add the breadcrumbs to a small bowl. Chop the parsley finely. Add the grated Parmesan/Romano cheese and parsley to the breadcrumbs, then mix together. Now add the melted butter and mix it in thoroughly. Using a spatula, spread the breadcrumb mixture over the surface of the dip. Then sprinkle the reserved jalapeño rings (Step 3) over the top. Place the container holding the dip into the oven (we use the center rack). Set a timer for 20 minutes. When the timer goes off, check the dip (if it’s not hot and bubbly, bake a few minutes longer). If the top doesn’t brown as well as you’d like, just run it under the broiler for a few minutes. Serve, adding some more jalapeño slices as garnish if you wish. Our version of this recipe calls for cooking the jalapeño and garlic before adding them to the cheese mixture. This might not be strictly necessary, but we think it makes for better flavor. You can skip this step if you wish, and just add the raw jalapeño and garlic to the cheese. We’ve seen recipes that use mayonnaise instead of sour cream. We haven’t tried this, but you may want to. Prefer a spicier dip? Add some hot sauce to the mix. Or just use more jalapeños. We’ve seen recipes that substitute crumbled crackers for breadcrumbs. If you go that route, crumble them finely. Triscuits or Ritz crackers would probably work well. Parmesan and Romano cheese both work fine in this dish (though Romano is a bit more zesty). We usually weigh the Parmesan/Romano cheese because volume measures vary a bit depending on how finely the cheese is grated. But exact measurements aren’t critical for this recipe. BTW, you could add some Parmesan or Romano to the cheddar cheese (Step 6) for extra flavor. Bacon is a nice addition to this dish. If you want to add it, here’s how: Fry 4 to 6 strips of bacon. When it’s just beginning to crisp, remove it from the pan with a slotted spoon and drain it on paper towels. Then pour off most of the bacon grease, leaving about 1 tablespoon in the pan. Use this to sauté the jalapeños and garlic (Step 5). Chop the fried bacon and stir it into the cheese mixture in Step 6 (you may want to reserve a few bacon bits for garnish). Have some dip left over after the party? It makes a terrific filling for toasted cheese sandwiches. “Glad I dipped into the recipe file for this one,” I said. “That particular file seems to be as stuffed as a breaded popper,” said Mrs K R.
“We’re just chip chompers,” said Mrs K R.
Another jalapeno popper recipe was in something I read yesterday -- it must be just the thing for the record-breaking cold spell in the Upper Midwest, plus superbowl. I bet it would go with any number of your cocktail creations! Hi Mae, this would be perfect with a cocktail. Any cocktail. :-) Thanks for the comment. Now this looks really good, plus it looks like it would not be quite as spicy as jalapeno poppers. Zippity-doo-dah it is! Hi Fran, as written, this recipe really isn't all that spicy -- just a hint. Because in a crowd, there are loads of people who don't want a lot of spicy heat. When we make it for ourselves, we double the number of peppers! :-) Thanks for the comment. Bring on the Superbowl food. I'm making my Green Chili recipe - this be a perfect starter. Hi Lea Ann, mmm, Green Chili! Sounds wonderful. :-) Thanks for the comment. I love jalapeno poppers and this dip is a fabulous way to get all the delicious flavors without all the work! Brilliant!!! Jalapeno popper mix is da bomb! I could seriously eat this whole bowl!! Hi Liz, the poppers have wonderful flavor, but the work! This is SO much better. :-) Thanks for the comment. Hi Laura, we did eat most of the bowl. :-) Thanks for the comment. Oh yes, my favorite! Lovely recipe and perfectly wonderful for dinner :) I'm in! Hi Jerry, more peppers would be good! This is relatively mild. Thanks for the comment. Hi Tricia, our kind of dinner! :-) Thanks for the comment. The make ahead feature has my undivided attention. A great dip recipe, allowing the cook a bit of free time to watch the game too! Hi Deb,just stick this in the oven about 30 minutes before ready to serve, and you're good to go. :-) Thanks for the comment. You got that right. Stuffing the traditional Jalapeños is laborious. Much rather make this dip instead. Easy peasy and so good for game day. This is a stunning idea. I agree, making stuffed cheese poppers is painful and messy and much easier to order at a restaurant. Until you have shared this Friday or Saturday afternoon dip, what a great and doable idea. Thank you and enjoy the superbowl. You've just created my idea dip--creamy, cheesy, and spicy. This looks delicious! Hi Bobbi, yup, the traditional poppers -- though really, really good -- are such a pain! Thanks for the comment. Hi Merryn, this is such a fun dish to make -- and eat. :-) Thanks for the comment. Hi Kelsie, we're good at cheesy recipes. :D Thanks for the comment. Great for The Super Bowl! It is a winner! Hi Denise, definitely a winner! :-) Thanks for the comment. wow This warm dip looks really inviting! I would probably end up eating the whole dish myself, John. Wow, this looks good, nice and cheesy. I'd love to give it a try. This does look wonderful. And it's definitely easier than stuffing jalapenos! My friend gets them already prepared from our grocery store, and they're wrapped in bacon. He barbecues them and they are to die for. I always forget to look for them at the store! This is a great dip. Hi Angie, we ate way too much of this for dinner one night. :-) Thanks for the comment. Hi Sherry, yup, some kind of game. :-) And the cheese is the real winner here! Thanks for the comment. Hi Natalia, it's good! :-) Thanks for the comment. Hi Amalia, it's definitely good and cheesy! Thanks for the comment. Hi Mimi, we've had bacon-wrapped poppers -- they're really good! Thanks for the comment. This is a much easier way to make the jalapeno poppers and with all the flavours! Hi Caroline, definitely easier! :-) Thanks for the comment. John, this looks lovely. I'm sure I would eat way too much of it if I didn't have lots of people to help me, so … Pinned this and will make for my next party! Hi Jean, definitely easy to eat way too much of this! :-) Thanks for the comment. John, I love the idea of this hot cheesy dip, sounds delicious with the crispy bread crumb on top...enjoy the rest of your week! Hi Juliana, hot, cheesy dip is so hard to resist, isn't it? Thanks for the comment. Hi Pam, you'll like this, I think -- really full of flavor. :-) Thanks for the comment. Actually it's the Superb Owl. 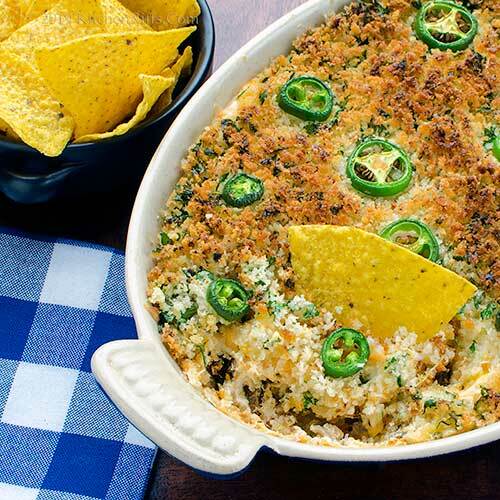 Hot cheesy dips are perfect for game day and any other day. Thanks for the great recipe John! The perfect dip idea. As a fellow dipsomaniac, this one I must try. Call me dippy, but I'm thinking I'll stuff a baked potato with the leftovers. Enjoy the game Sunday and I hope your team chips away at their opponent. Hi Gerlinde, yup, and we know cheesy! :-) Thanks for the comment. Hi Ron, terrific idea to stuff a baked potato with the leftovers! Gotta try that. And you do know your puns! :-) Thanks for the comment. What a fun twist on jalapeño poppers, the dip looks amwesome. Game day, dinner, midnight snack -- I'm in for this any time! Sounds delicious -- a total comfort food packed with flavor! Hi Evelyne, it IS awesome! :-) Thanks for the comment. Hi Valentina, midnight snack works or us! :-) Thanks for the comment. My family has always loved a dish that involves jalapeños! And this dip is simply a party winner. Surely trying it this weekend! Hi Lola, jalapeños are pretty hard to resist, aren't they? Real favorites of ours! :-) Thanks for the comment. All Super Bowl watchers and party goers need a great dip... A dip with a little heat makes the beer taste that much better. Hi Velva, beer would be wonderful with this! :-) Thanks for the comment. I’m in the “let’s call it dinner” club! Can’t wait to try this, John! Hi David, dinner for us too -- football has lost its charms for us, alas. Whole game has gone downhill. Thanks for the comment. An irresistible dip for the big game or any party actually. This might make it through the first quarter. Happy Super Bowl Sunday John! Hi MJ, first quarter? You're an optimist! :) Thanks for the comment. Oooh, just add some frosty glasses of brewski and you are set! Hi Carolyn, yup, this is good with brewski. :-) Thanks for the comment. Hi Charlie, in truth, for most people I think the Super Bowl is more about the food and the commercials than the game. Often the game itself is kinda boring (although there certainly have been some exciting ones). Thanks for the comment. This is so perfect with the cold beer I am holding now. Hi Raymund, yup, this is a dish that's made for cold beer! :-) Thanks for the comment. Yippee! I made this dip yesterday for the Game and it was delicious.I only used 2.5 jalapenos for the 'body' of the dip, instead of 4. I then 'washed it down' with homemade chili and Boston Cream Pie (and then some alka seltzer- "I can't believe I ate the whole thing")! David, I tried making this dip and it was delicious! Hi Fran, glad you liked it! I haven't had Boston Cream Pie in ages, and no you have me craving it. :-) Thanks for the comment. Hi Greg, we're always looking for a party! :-) Thanks for the comment. I don't need a party to make this dip. I'd have it for dinner! Hi Jeff, it makes a great dinner! :-) Thanks for the comment. Hi Gingi, it IS good! :-) Thanks for the comment. Hi Marcelle, you'll love not sharing this! Of course the rest of the family won't be too happy. :-) Thanks for the comment. 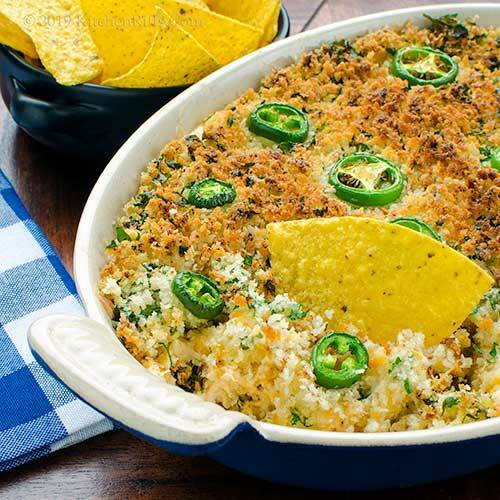 This dip is amazing, can be part of any gathering..love jalapeno. Hi Amira, we really love spicy peppers too! And yes, this IS amazing. :-) Thanks for the comment. Everything I love about jalapeno poppers minus all the work - brilliant! Hi Kelly, no-work works for us. :-) Thanks for the comment. I think I will stick to your origional suggestion of using sour cream, this dip sounds heavenly. Hi Emma, sour cream is really nice in this! Thanks for the comment.